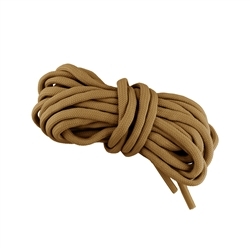 550 Survival Paracord Boot Laces are made with mil spec quality nylon paracord with 7 inner strands. These laces are unbreakable and are designed to replace normal boot laces. In a survival situation, you can pull the inner lines for use, such as fishing, sewing or wound management. Cut to correct lengths and tipped with plastic for easy use. Length is 96", twenty four inches longer than issue 72" boot laces. Extra long length for taller boots, more wrapping and plenty of survival cord in an emergency. Now Available in Coyote 498 for the Army and Marine Corps uniform boots.